I have been letting it sit for a while thinking about the hand quilting and waiting for it to talk to me. It did so I started to mark it today. 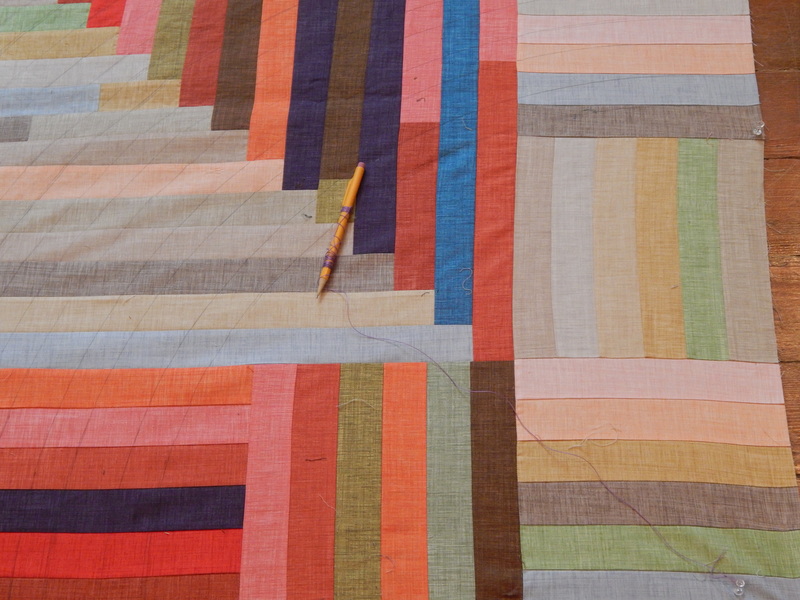 I tied a long piece of perle cotton to a pencil and tacked the end to the corner of the quilt and used it to draw arcs. they aren’t perfect by any means but they will be good enough for me to see where I am going with the quilting, and I promise that the pencil marks will wash out. Next I moved to the next corner and did it again. Teddy doesn’t understand that being close to the floor doesn’t seem like a problem to him. This entry was posted in Quilts and tagged hand quilting, P&B textiles, Quilts. Tim, have you quilted a EPP quilt? I am interested how you quilted or would quilt one. Nifty idea! I take it you worked from the center to the corner,wrapping the string around the pencil to take up the slack. 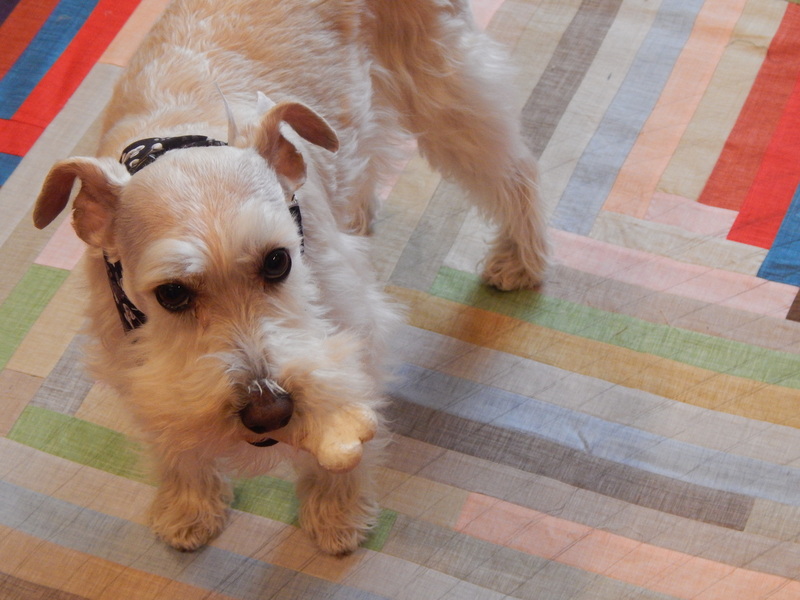 Teddy is so cute with his bone. Tim, how to you get out the pencil marks? Love your helper. Mine licks my ears when I am down on the floor working. — Like the arc idea. Might copy that thought on a future quilt. Teddy licks ears too…but his favorite is noses….and he always gets my glasses …..
Love that part “waiting for the quilting to talk to you”. I am really interested in seeing how this pattern you chose works out. And yes, after spending a great deal of time on my hard floor thread basting two weeks ago I can really sympathize with how the life of a hand quilter can be tough on yhe body!! Happy quiltinv Tim and Teddy! I have several old tops that will not talk to me…so I keep waiting 🙂 and yes so many people do not realize that quilting can be very physically demanding ! I call it letting it ‘percolate’ even though I’m not a coffee drinker. Can’t wait to see the quilting progress on this one! Teddy is looking excited too. There is certainly a lot of quilting to be done! Maybe a week?, hee, hee. How difficult will those seams be to quilt through? I’ve always been put off log cabins just because of those seams. 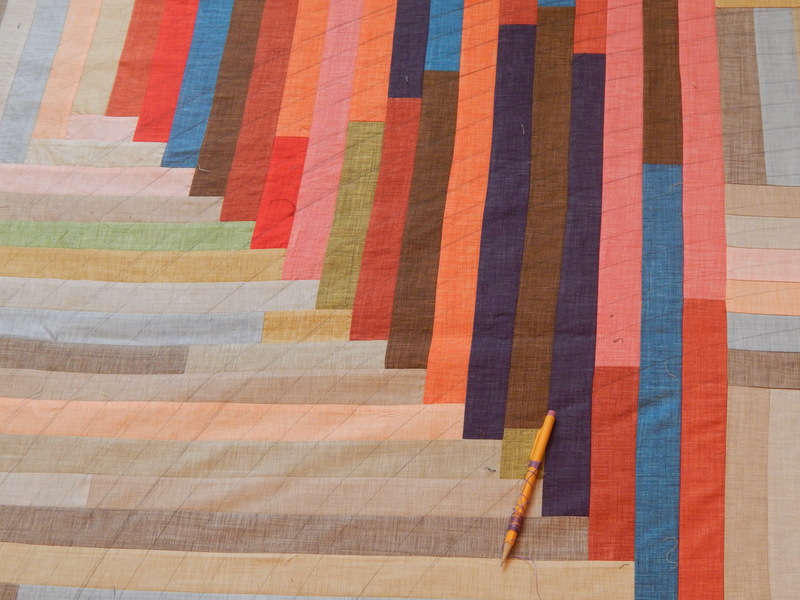 What a great idea for marking a quilt, and I also am looking forward to seeing this one in progress! Do you use ‘Thread Heaven’ on your thread? I’m amazed by the stuff for hand quilting, but new to it. 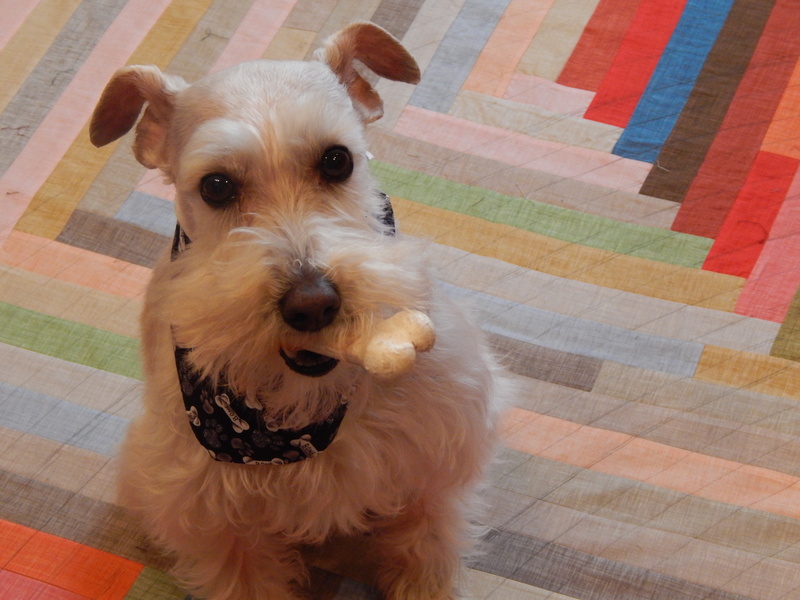 Love your Teddy, we have a white schnauzer, Snowy! I have used thread heaven if a thread is “fuzzy” but no need to use it on hand quilting thread which is glazed. and I do not use it on perle cotton thread either…. 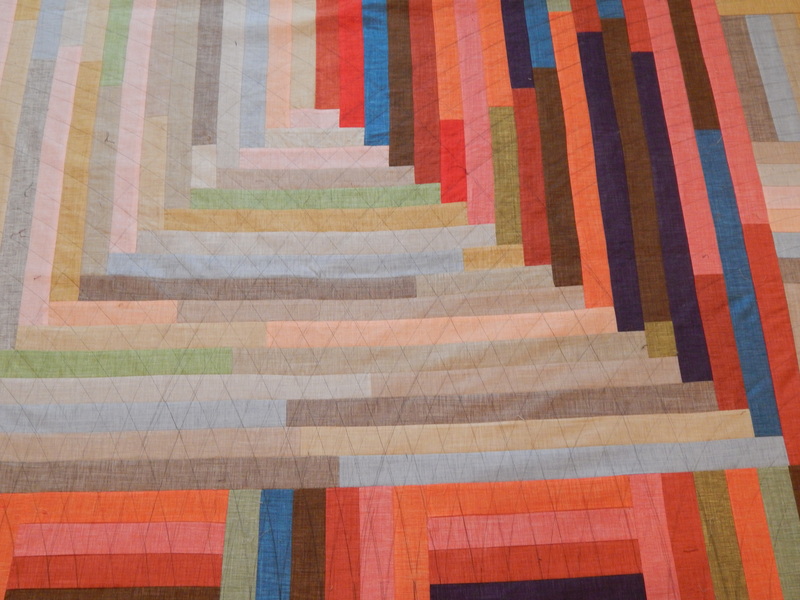 What a great look this quilting design will be! I really like the way the arcs will be overlapping…that is going to add a great dimension to the design…cannot wait to see how it turns out! Isn’t it amazing that, with all the fancy quilting tools that are available now, just simple items we have on hand can work so well in the marking process…and easily adjustable to work with any size quilt…I see that Teddy has his bone…I guess he knew it might take a while to mark this one! Great string theory!It will look fabulous,as does your assistant! 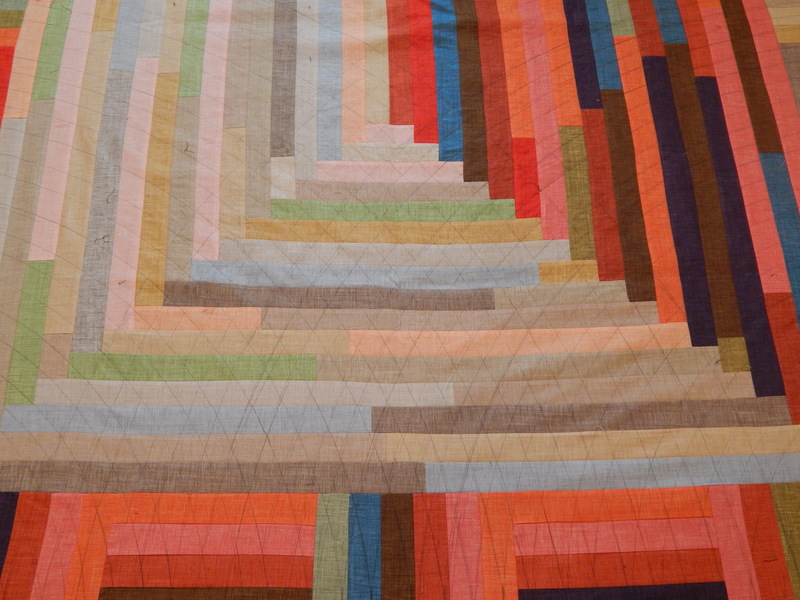 I have a large EPP quilt I’m about to complete the top of, and I’ve been considering how best to hand quilt it. For that one, I’ve already decided on a basket work design, but I think the next one will feature this lovely design of yours, because in my opinion, an overall pattern gives a beautiful texture without detracting from the hexagon designs. Marking with a helper? I thought that would mean Teddy holding down the fabric with a paw, or you using his paw as a measurement. But I forgot — he only inspects. Inspection is where his expertise is focused. 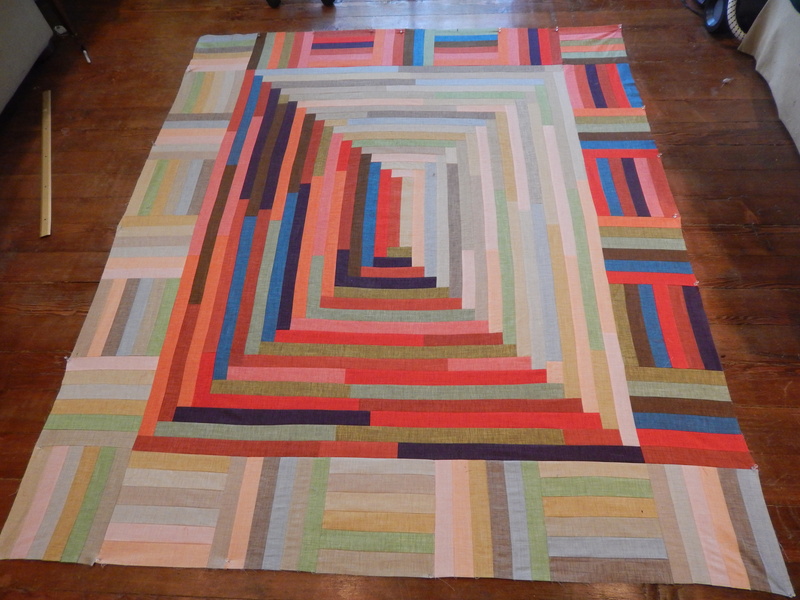 That’s going to be some crazy wonderful quilting on this great piece. (I also hand quilt, so I understand and appreciate the process). You are so kind to reply to each email, but don’t feel you have to on mine – just use that time to take some extra stitches. Teddy is adorable, as always. My family always called that quilting pattern “Baptist Fan” for the fans they used in church before air conditioning. If you roll out another rug on top of the one you are using it is easier on the knees, although at this point my knees would need those big knee protectors you see people use when they tile a floor, or roof a house. Your quilt top looks 3D. It will be gorgeous!